Sharon Muhwezi is passionate about constructive writing and sharing skills. 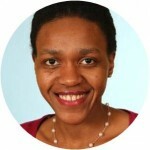 Her non-academic/non-job writing includes career and education pieces for Uganda's Daily Monitor. She also works as a freelance editor/tutor.